Capital's 52-inch Cabinet Gas Grill gives plenty of work space both on the grill and off, with options for chopping block inserts on both side tables. The hood is spacious, controls are chrome plated, and cabinet construction is seamless and smooth -- eliminating weak points and sharp corners. Capital put a lot of design effort into the appearance of this grill, paying attention even to small details like hidden casters. 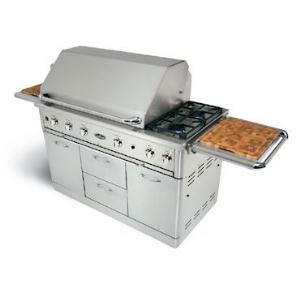 Total heat output for this large grill is over 100K BTU's, including a 30K double side burner available even when the hood of the main grill is closed. Four main burners run at 25K apiece, with one burner converted to infrared. The infrared burner has high-medium-low settings for searing as well as slow cooking. A fifty-pound capacity rotissierie in the rear runs on a separate 15K burner unit. The warming rack is easily removable for better access to the rotissierie area. Halogen lighting for evening cookouts is a standard feature built into the double-walled hood. The electronic ignition system is reliable and convenient, powered by 9V batteries. A smoker box is available as an accessory. Capital's grease reduction system includes grease collection pans on rollers, with disposable pan liners to collect the waste oils. You'll want a nice BBQ tool set to go with such a nice grill, too.